Recently I had an interesting conversation via the comments section on an old post that featured Fresh Peach Ice Cream. Someone had made the ice cream and as a newcomer to ice cream making had experienced a few difficulties. She wanted to understand what had happened. As we conversed I realized that a lot of the questions could have been answered via a "basics" post on ice cream....which I have never done. Since I love ice cream...and have posted several recipes...this seems like a bit of an oversight. It occurred to me that I should remedy this as soon as possible (any excuse to make ice cream...). Ice cream, in its most basic form, is just a frozen mixture of sugar, cream and/or milk and optional flavorings. 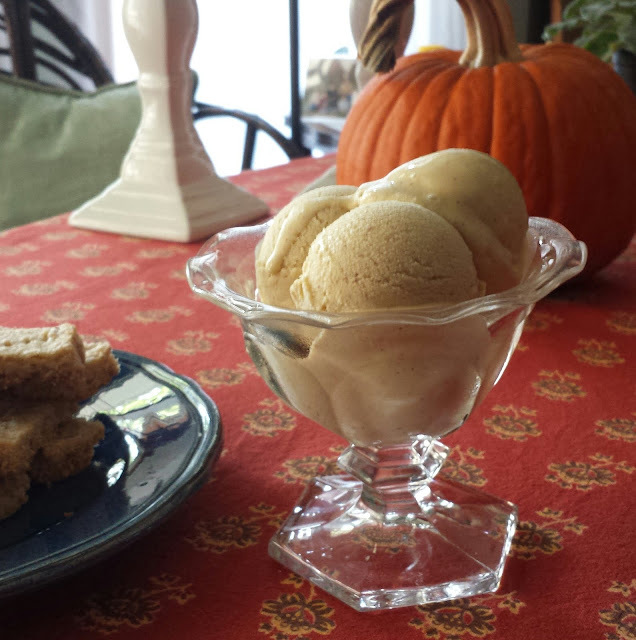 Ice cream recipes have also traditionally included egg yolks. The properties of the egg yolk produce an ice cream with smaller ice crystals and a smoother, richer texture. Egg yolks also add fat—which in turn makes for a richer, more decadent result. It may seem very strange to us—in our era of a salmonella-tainted egg supply—but it was not uncommon at one time to just add raw eggs to the sweetened dairy and then proceed with freezing the whole mixture. The eggs would never have been cooked. This isn't something most of us would be comfortable doing today. 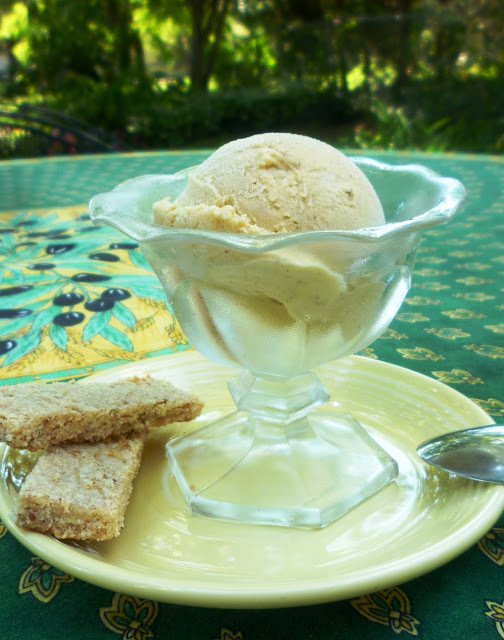 Fortunately, eggs can be incorporated into ice cream in a cooked form—giving all of the benefits, without any of the risks, associated with raw eggs. To do this, the egg yolks, sugar and dairy are simply made into a stirred custard—also known as crème anglaise—before being frozen. These kinds of ice creams are often called French ice creams...or custard-style ice creams. And I think they are fantastic. To me, they are pretty much the only kind of ice cream. With the exception of my Banana Chocolate Flake Ice Cream, all of the ice creams on my blog are made with a custard base. Not only will cooked egg yolks add all of the advantages of eggs as described above in their role as an emulsifier, cooking the egg yolks harnesses the coagulating property of the egg proteins. Thus, a cooked base is typically thicker and creamier than an uncooked base. Even if you have never made a stirred custard, you are probably familiar with baked custards. For a baked custard, a mixture of eggs and milk/cream (plus sugar for dessert custards) is combined, poured into an oven proof container and then baked at a low temperature until it is "set"—i.e. firm enough to slice or scoop. Examples of baked custards include crème brulée, pot de crème, and quiche. As the egg/dairy mixture begins to bake, the protein molecules in the eggs start to unwind. As the temperature of the custard increases, these unwound proteins begin to grab onto one another and form a mesh of egg protein that holds the liquids in suspension...creating a soft solid. The process is the same for a stirred custard except that instead of subjecting the egg proteins to the heat of the oven, they are cooked on the stove top. Instead of sitting undisturbed as the temperature of the custard increases, the mixture is kept constantly moving. In the finished custard the liquid is still held in suspension in an egg protein mesh...but the stirring action doesn't allow the mixture to set into a solid. Instead, the result is a thickened liquid. The only difficulty with making a custard has to do with the fact that the range in which eggs coagulate is fairly narrow. Eggs begin to set at 160° and are fully coagulated at 180°. If a custard is heated beyond 180°, the proteins which are tightening their hold on one another as the temperature increases, will harden and release (squeeze out) the liquid you are trying to thicken. The result is a thin liquid with firm bits of cooked egg floating in it. In other words, the custard will curdle...or "break". The process of making a stirred custard intended for ice cream is very straight forward, but it is designed to help you avoid a curdled or broken custard. To begin, place half of the dairy into a saucepan. Sometimes half of the sugar is added to the pan too. The remaining dairy is put in a bowl that is large enough to hold the finished custard. This bowl is placed in the refrigerator or in a bowl of ice water so that it will be thoroughly chilled. The egg yolks are placed in another bowl and whisked until smooth. At least half...sometimes all...of the sugar is whisked into the yolks. The saucepan of milk/cream is brought to a simmer. Then, while whisking the egg-sugar mixture constantly, some (about a third) of the hot milk/cream is added in a thin stream. Since the liquid is boiling (212°) it has the capacity to curdle the egg yolks on contact. Adding the hot liquid in a thin stream while whisking constantly allows the temperature of the yolks to gradually increase. This step is called "tempering" the egg yolks. The presence of the sugar in the yolks also helps protect the yolks since it increases the temperature at which the yolks are fully coagulated by a small amount. I mentioned that some of the sugar is sometimes added to the saucepan with the milk/cream. This is the classic method. Since a small amount of sugar is enough to protect the egg yolks during the tempering process and since adding a large quantity of sugar to the yolks can make them very stiff (and thus make it difficult to smoothly and quickly incorporate the hot milk/cream), adding some of the sugar to the milk/cream where it will dissolve simply makes the mixing process easier. Once the egg yolks have been tempered, the saucepan of remaining milk/cream is returned to the heat and brought back to the boil. The temperature under the saucepan is reduced to medium and the tempered yolks are whisked into the hot milk/cream. Since a substantial amount of your sweetener and thickener are in your bowl of yolks, make sure you scrape the bowl well. If you have an electric stove (and the heat under your burner doesn't immediately drop to medium) remove the pan from the heat while you whisk in the tempered yolks. When all the yolk-sugar mixture is in the pan, return the pan to medium heat. You are now at the stirring point of your stirred custard. You must constantly and evenly stir in a figure eight—or other motion that efficiently and regularly moves all of the liquid around in the pan (stirring in a circle for example would leave a possible "hot spot" in the center of the pan). As you stir, watch the custard for visible signs that it is thickening. At first, the custard will be very thin and will slosh around as you stir. There will also be lots of foamy bubbles on the surface. As the custard thickens, the sloshing will decrease and the foam will dissipate almost entirely...only a few, more substantial bubbles, will remain on the surface. The classic method for testing the custard is to check to see if it coats (or "naps") the back of a spoon. I don't use this method because I like to stir with a heatproof spatula which seems to discourage the custard from adhering. But if you are using a wooden implement, this method works well. Simply lift the spoon out of the pan and draw your finger across the custard that is adhering to the spoon. If the custard is finished, the path will remain. The fool proof way to monitor your custard when you are still learning the visual cues is to use an instant read thermometer. Stir with one hand and hold the thermometer with the other (or clamp it to the side of the pan---whatever you do, don't stop stirring). The final temperature of the custard should be around 170° to 175°—well in excess of the instant kill temperature of salmonella (160°) and under the threshold at which the custard will curdle/break (180°). If my bowl of cold cream was not set in a large bowl of ice water (an ice bath) before, I set it in one now so that I can (for food safety reasons) get the temperature of the finished custard down below 70° as soon as possible. I usually leave it in the ice bath until the temperature is below 50°. I then transfer it to the refrigerator. At this point, you want to allow the custard to get as cold as your refrigerator will get it (hopefully below 40°). I usually let mine chill for 6 to 12 hours. During this time the flavor of the base will bloom and develop. Also, the custard will continue to thicken a bit. Furthermore, if you are using a chilled canister-style of ice cream freezer, you want your base to be as cold as possible before pouring it into the canister. This will make it so that all the freezing capacity of the canister (acquired from its time spent in the freezer) will go towards freezing the ice cream...not cooling the custard base. I can't overemphasize this last point. The pre-chilled canister styles of ice cream freezers make wonderful ice cream...but only if the canister is very cold. I chill mine in a second freezer in my basement that holds a consistent temperature between -10° and -20°. On one occasion recently I had trouble getting my ice cream to set and I noticed that my freezer had cycled and the temperature was hovering just above 0°....which is still very cold, but apparently not cold enough. I actually store my canister in the freezer (so I can make ice cream any time I want)...but if you don't store yours in the freezer you will need to chill it for a full 24 hours before trying to use it. When we first purchased our ice cream freezer we kept it in our everyday freezer which, because we are in and out of it constantly, maintains a temperature between 0° and 10°. We were able to make ice cream...but it never got as hard as we thought it should during the churning process. One final point about the freezing process: When you churn your ice cream, most ice cream freezers will produce a finished ice cream that is the consistency of "soft serve" ice cream. This "finished" ice cream should ideally be transferred to a chilled container (I put the container that will receive the ice cream into the freezer when I start to churn the ice cream) and placed in the freezer for a few hours to firm up. Often the ice cream will become too hard to scoop easily during this time. If this happens, just set the ice cream in the refrigerator for 20 to 30 minutes before scooping and serving it. If you look around at ice cream recipes, you will soon notice that each cook/chef is usually working from a favorite standard recipe that they flavor in various ways to achieve all kinds of different ice creams. Certainly this is what I do. My basic recipe follows (more or less) the following formula: For every cup of dairy (milk/cream) I use 2 egg yolks and 1/4 cup of sugar. I usually make three or four times this recipe. Three times will yield almost exactly a quart of ice cream. I almost always use half milk and half cream. You might think that an ice cream would be better and more authentic when made with all cream. But this is actually not the case. Ice creams with too much cream have an unpleasant tongue-coating texture (comparable to frozen butter...). Too much butterfat at that temperature will actually mute the flavor of your ice cream too. Occasionally I will use 2/3 cream...but this is almost always because I have replaced some of the volume of liquid with a purée of some kind (strawberry or peach....or pumpkin...for example). These kinds of purées contribute no fat, so they can essentially be thought of as part of the milk component. As for the eggs, 2 yolks per cup of dairy might seem high...and I admit that the amount I use is higher than most...but a high proportion of yolks yields an ice cream with smaller ice crystals and a smoother, richer mouth feel. In practice, this means I use 6 yolks for a quart of ice cream. You can of course reduce this if you like...but I would not go lower than 3 yolks (or 1 yolk per cup of liquid). You can obviously increase or decrease the amount of sugar to suit your palate as long as you are aware that sugar alters the freezing point of the ice cream. 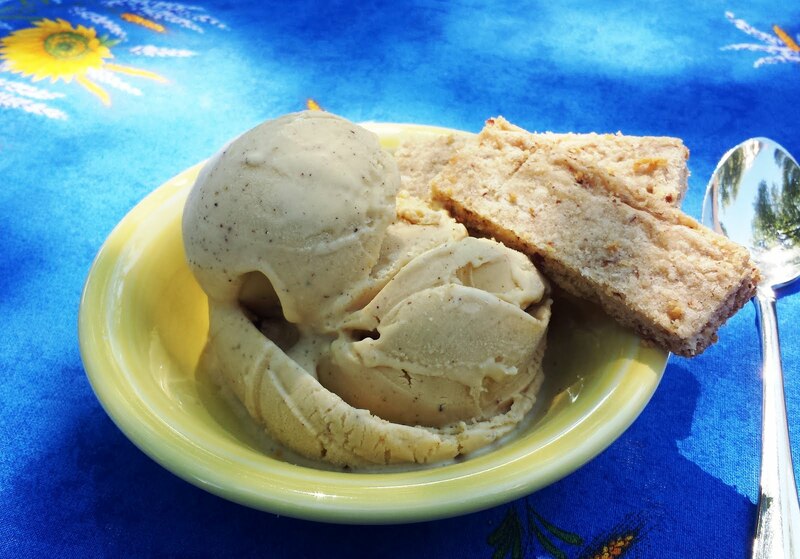 Less sugar will mean an ice cream that is much harder/firmer. More sugar will make a softer ice cream. If you use too much sugar, your ice cream may never really set up beyond "soft serve" consistency. It is worth pointing out that alcohol is basically sugar...and therefore adding even a small amount can make for a softer ice cream. Ice creams can of course be flavored in a myriad of ways. The easiest way is via steeping or infusion. Simply drop a vanilla bean... or mint leaves... or espresso beans... or citrus zest... etc.... into the milk in the saucepan and bring it to a simmer. Then, instead of immediately tempering the egg yolks, remove it from the heat, cover it, and let it sit (or steep) for 20 minutes to an hour (or more...depending on the flavor). After steeping, proceed with making the custard as usual. Other flavors—as mentioned above—can be made by replacing some of the milk with a purée of some kind. Crunchy things—like nuts, chocolate bits, toffee, etc.—can be added simply by folding them into the finished softly set ice cream. Truly the sky is the limit when it comes to making interesting and delicious flavors of ice cream. As is almost always the case when I write a basics post, this one has been quite long. Even so, there is no way I could have covered everything... But I think this one should go a long way towards answering some of the more common questions about making a custard style ice cream. 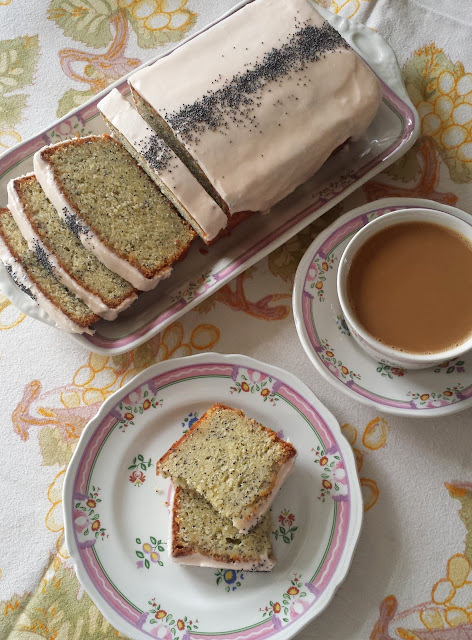 And since I wouldn't want to write such a long post without including a recipe, I am including one. As I thought about what flavor I wanted to make, it occurred to me that pumpkin season was almost upon us. 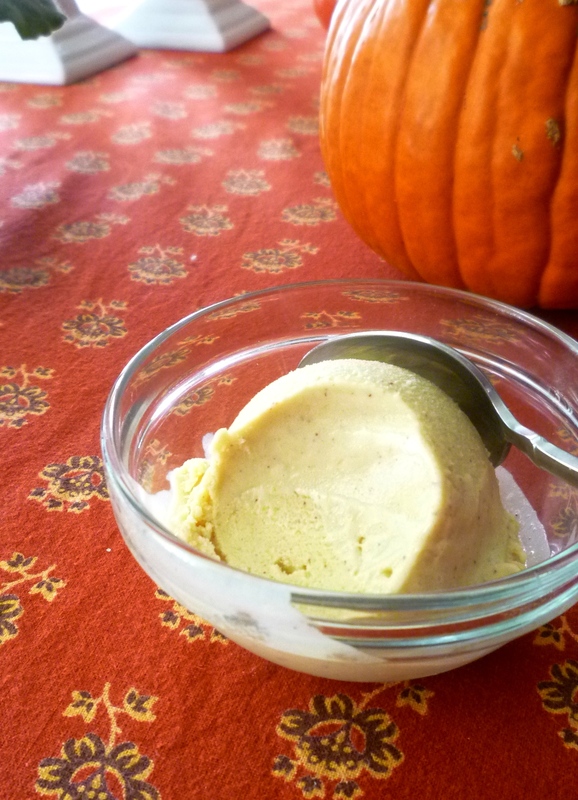 So if you have never made ice cream before...and you're in love with all things pumpkin spice, this ice cream will make a great place for you to start. In a small bowl, combine the pumpkin with the spices. Chill. Place the milk and 1/2 cup of the cream in a medium-sized, non-reactive saucepan and bring to a boil. While the milk mixture is heating, pour the cold cream into a medium-sized chilled bowl. Place a bowl sieve/strainer over the bowl, set aside and keep cold. In a small bowl, whisk the egg yolks with the sugar until smooth. When the milk boils, temper the egg yolks by gradually whisking in a third to a half of the hot milk mixture. Bring the milk/cream mixture back to a boil, remove from the heat and stir the tempered egg mixture back into the saucepan. Place the pan over medium heat. 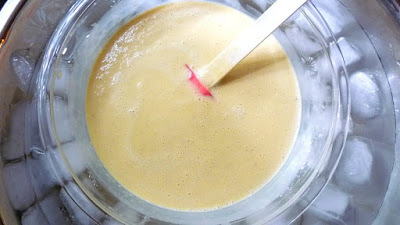 Cook, stirring constantly (in a figure-eight motion), until the custard begins to thicken and most of the foamy bubbles on the surface have dissipated. Other indicators that the custard is done: a path will form when you draw your finger across the custard-coated back side of the spoon—and an instant-read thermometer will read about 175°. Immediately strain the custard into the bowl of cold cream. Stir in the pumpkin-spice mixture, the maple syrup and vanilla. Chill the mixture until very cold. 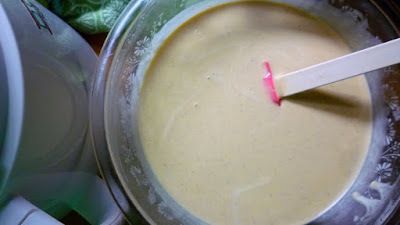 (It works best to set the bowl of custard in a large bowl of ice water. This brings the temperature of the custard down quickly.) Cover and refrigerate until ready to use. Freeze the ice cream in an ice cream machine according to the manufacturer’s instructions. Transfer to a freezer container and freeze until firm before serving. Makes a quart of ice cream. Note: I made my ice cream with freshly roasted and dried pumpkin purée...but you can of course use canned solid pack pumpkin. If you use canned pumpkin you should strain the finished custard (after adding the pumpkin) through a fine sieve. 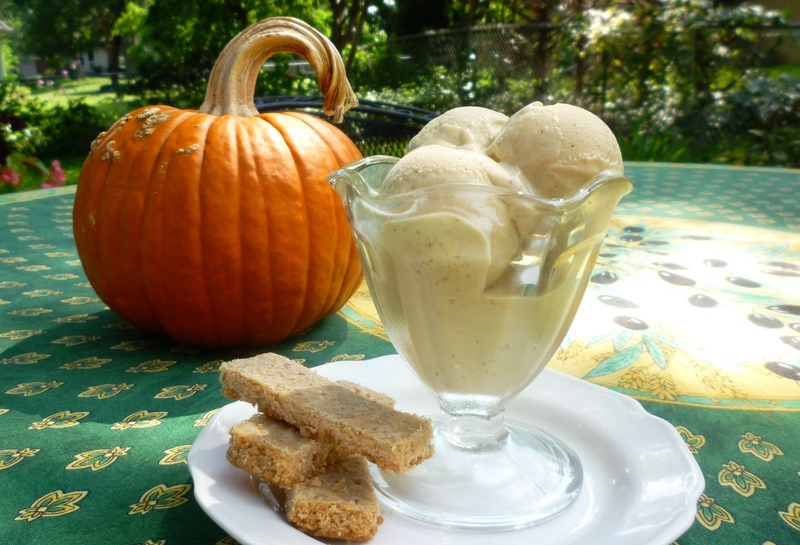 Canned pumpkin can be quite fibrous and the texture would be unpleasant in the finished ice cream.